! ! ! ATTENTION PARENTS ! ! ! Enjoy your night out while the kids do too! Drop off event for ages 7+. Parents are welcome to stay with with their kids 6 and under. Friday, October 19th, 6:15 - 8:30 pm. DARIEN STUDIO. $32 per painter plus tax. This price includes free pizza / $16 piece of pottery per painter / movie. Drop off is from 6:15 - 6:30 ... Movie starts at 6:30 ... Pick up time is at 8:30 pm. Registration is required for this event. Limited space available. Sign up below, or call/email us at the shop. Questions?.... please reach out! Signing up with multiple painters? 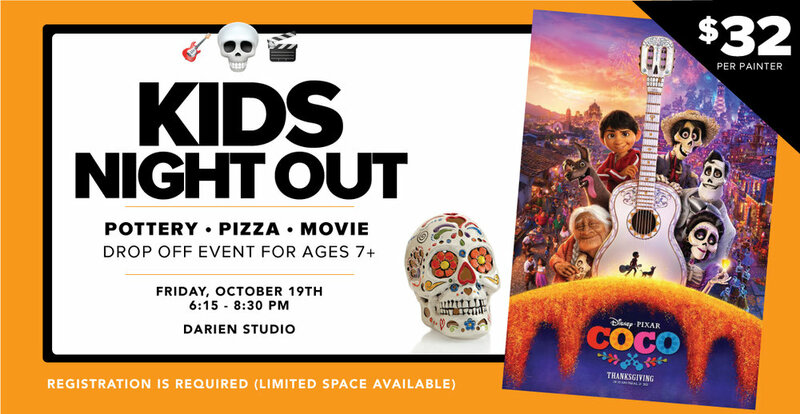 Thanks for signing up for the Kids Night Out at our Darien studio on October 19th. We’ll be watching COCO. Just a reminder, drop off is at 6:15 and pickup is at 8:30 pm. If you have to cancel your reservation for whatever reason, as a courtesy, please let us know, since limited space is available. Also, we reserve the right to call you for an early pickup if your child isn’t cooperating. We look forward to having a fun evening! Payment can be processed at the night of the event - OR - you can pre pay over the phone. just give us a call. 203.656.3995.